I have had the good fortune to speak to many people in the media about my situation and this has resulted in some appearances and interviews. Of particular note, I would mention Nick Wallis from Enpsychedelia on Radio 3CR and his show that broadcasts from 2 – 3pm every Sunday afternoon (Melbourne, Australia time). I have had the good fortune to be a regular on his show, even going back to the good old days, when it was just a podcast. The Enpsychedelia Blog can be found here and they are active on Facebook as well. 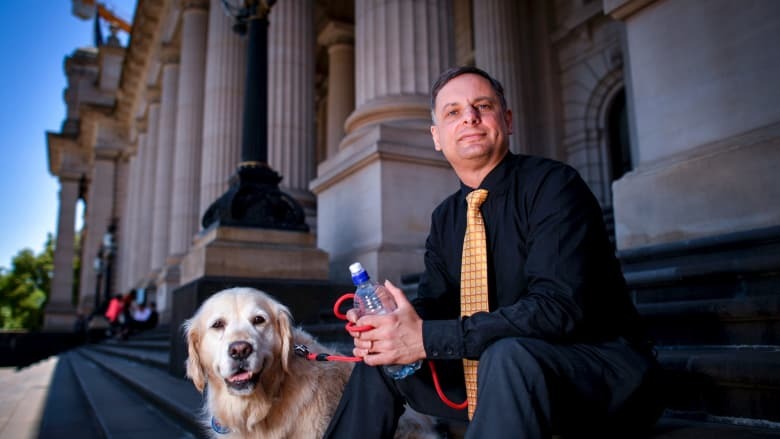 Greg Kasarik and Saasha, his Amazing Golden Retriever, on the Steps of the Victorian Parliament House. “Back in January, Greg Kasarik was pleading guilty in the Melbourne Magistrate’s Court for LSD possession when he admitted to the judge that he had more tabs his pocket. Immediately, Greg was escorted off the premises, arrested, and charged again. Then earlier this week, he was back in court. This might sound like an unusual turn of events for a guy who’s spent 10 years in the army. Perhaps not though if you consider he left the armed forces to do his honours in psychology. And that’s how, in his late 30s, Greg ended up at a party with people doing shrooms. He’d never taken psychedelics in his life. But he decided to join in, the first step on spiritual odyssey from which he’s never looked back. “Greg Kasarik is a drug user who is probably too honest for his own good. This week, when he had a charge dismissed by a magistrate after pleading guilty, he volunteered to Melbourne Magistrates Court that he was again breaking the law by possessing a drug of dependence. He was escorted outside the court by three police officers, arrested and charged again, and is due to return in three months. “Greg Kasarik appeared in Melbourne’s Magistrates Court on January 10 this year, on a charge of being in possession of a drug of dependency. Kasarik was arrested on April 19 last year, when he was found in possession of LSD, while he was tripping on the steps of the Victorian parliament house.